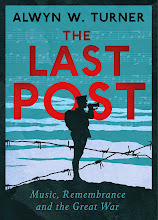 I was scheduled to speak on the subject of The Last Post at Hatchards tomorrow, to mark Armistice Day. I'm afraid I've had to cancel this. My apologies.